STM – Sellick Equipment Ltd.
Sellick Equipment has been designing and manufacturing rough terrain forklifts for nearly 50 years. The STM product line consists of a variety of models each with their own features and benefits. The conventional three wheel drive with capacities ranging from 5,500 to 7,000 pounds and have lift heights to 12 feet. Pantograph reach equipped models for unloading from one side which removes the need to move the truck to unload the other side and the 4 Way multidirectional model for handling long loads in tight spaces. The 4 Way model also can be equipped with the pantograph reach. Our support team provides assistance through the entire decision making and installation process when it comes to application, truck/trailer model selection, mounting kit installation and operator training. We are here to serve you! Sellick Equipment Limited can assist in vehicle load distribution calculations. It is the responsibility of the end user to ensure the safety and structural integrity of the vehicle to which the mount will be applied. All weight distribution data sheets must be signed and forwarded to Sellick Equipment Ltd. by the dealer, end user or third-party installer. They must also include all the required information. Completed weight distribution data sheets deemed satisfactory or unsatisfactory must be distributed to the Sellick representative, the dealer representative and all other parties involved. If "YES" Please specify mount in "Comments" below. I certify that the above specifications are true and correct. 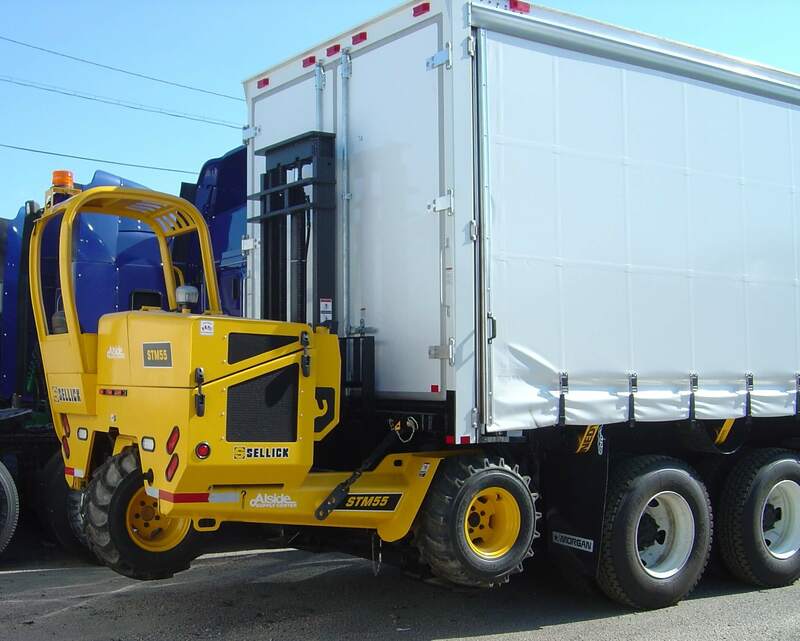 We start with an easy-to-access, roomy operator platform that provides clear visibility and fingertip controls for safe and efficient operation. A multi-function LCD display features easy to read machine functions, on board diagnostics to reduce downtime, and also provides operational guidance. The STM 4 Way multi directional models are equipped with a one-touch button that transitions from standard configuration to 4WAY mode. This feature eliminates the need to "search" for the function allowing the operator keep focused on the load and obstructions in their travel path. The Sellick STM is designed to operate the same as a conventional forklift thus providing quick and safe operation of the machine. The EZ Drive consists of three components. A column mounted forward/reverse shifter, a throttle pedal and brake pedal with full inching capability. EZ Trac is an operator controlled traction system designed to power the machine through adverse ground conditions. The operator simply touches a momentary switch to maximize traction to all wheels. The system is designed to stay activated until the forklift senses that traction has been restored or a specific time has passed.